If you’re looking to purchase washers of almost any type, ranging from Form A washers to plate washers and steel washers, look no further than our washer range here at Orbital Fasteners. We have compiled our selection of washers, such as Galvanised Washers, to encompass the needs of our customers for almost all situations and, as such, square plate washers, we are confident that you can find it for sale at a fantastic price here at Orbital Fasteners. 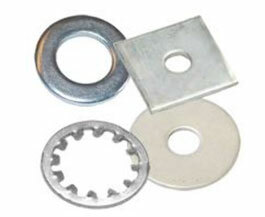 Our washers are available in both mild steel, the same material used for a range of our bolts and stainless steel, a versatile material, variations to ensure that, whatever the situation and usage, you can purchase thewashers, such as shakeproof lock washers you need for the job you’re doing.